Wow, so many options here. How much do you want to invest in lighting? Any time there's a carnival-type setup with lots of round transparent plates lined up, the temptation is to make them all race like a marquee, but then cost becomes a definite factor. Fireplace: 4x flickering LEDs (we had these in our setup for the Haunted House kit a few months ago, and could easily develop something for this fireplace that would look nice and which wouldn't require an external effect controller so cost would be lower). Transparent plates surrounding the front door: these could definitely be setup in a marquee effect. A lighting effect controller and several daughterboard controllers would be needed (similar to what we set up for our Ferris Wheel kit). Flashing Pico LEDs behind the eyes of the large Joker face inside by the slide. Marquee effect in the two arrows on the inside of the house. This would increase cost because of the need for 2 lighting controllers, but the effect would be awesome. Our spotlights shining up on the JOKER sign on the front of the building (maybe with two of them connected to our lighting effect controller with burned-out bulb effect to make it look extra creepy). Various assorted room lighting inside (maybe different colored lights on ceilings in different rooms). Again, since we don't have the kit ourselves, it's difficult to say definitively what would work and what wouldn't, and with a set like this, with so much lighting potential, the biggest limiting factor would probably be cost. I really like those ideas! 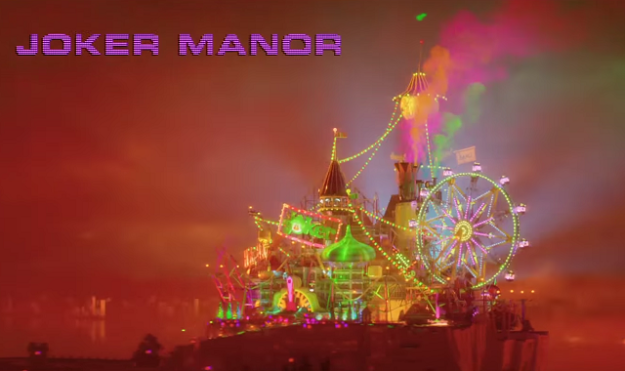 I have attached a picture of the joker manor from the movie. I really like the strung lights from the tower thought that would be a cool effect. 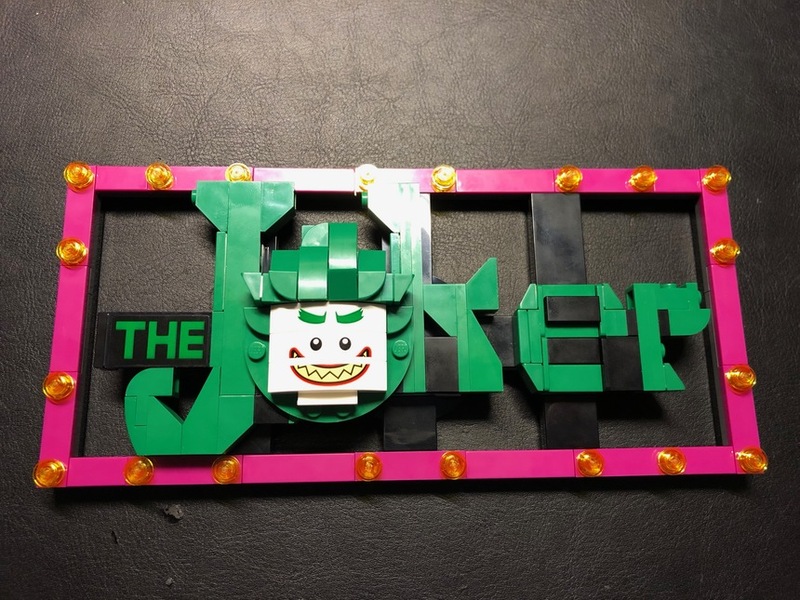 I do like the idea of lighting up the joker sign with the spotlights maybe in green? Or a marquee border around the joker sign? And the marquee effect of the door and arrows. Is there anyway the HA HA HA could light up and maybe have one of the letters have a flicker effect? 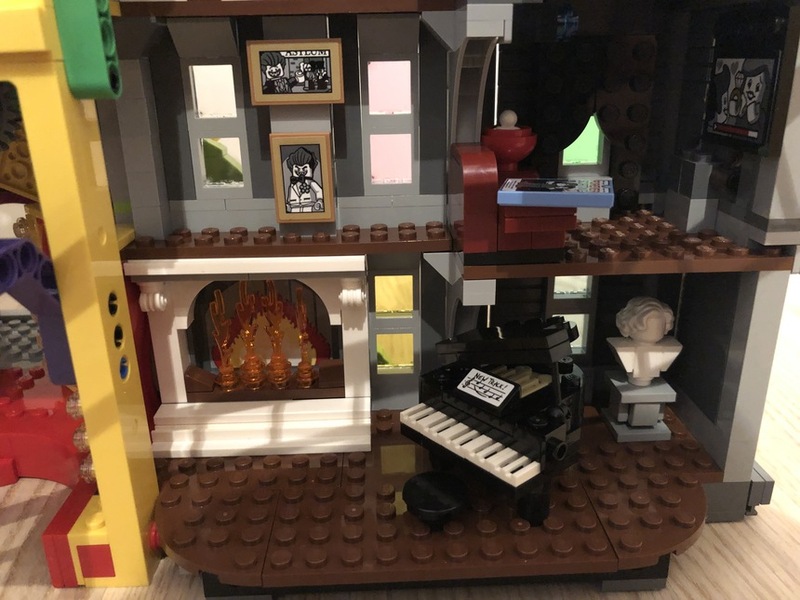 I am unsure of the costs of all of these items I was hoping to keep this under $100 the exterior effects are more important to me then the interior ones. Hey guys. 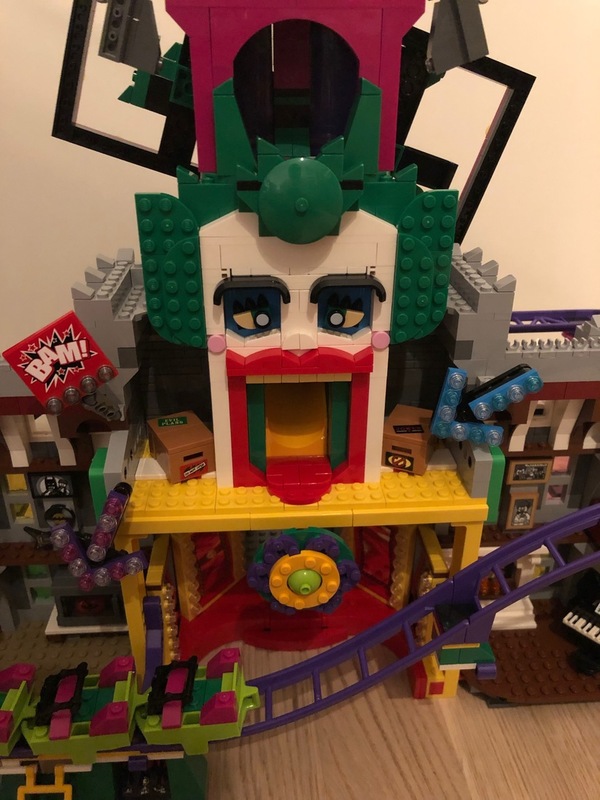 I'm just thinking to build up the joker manor, and especially to motorize the roller coaster, as the 10261. The idea to light up these set, sound very cool, particularly the ideas of rob. To go more in detail, first I should build up the set. But maybe this is my next project. Freakmaster Right! It's amazing, but cost would be prohibitive I think to light everything. 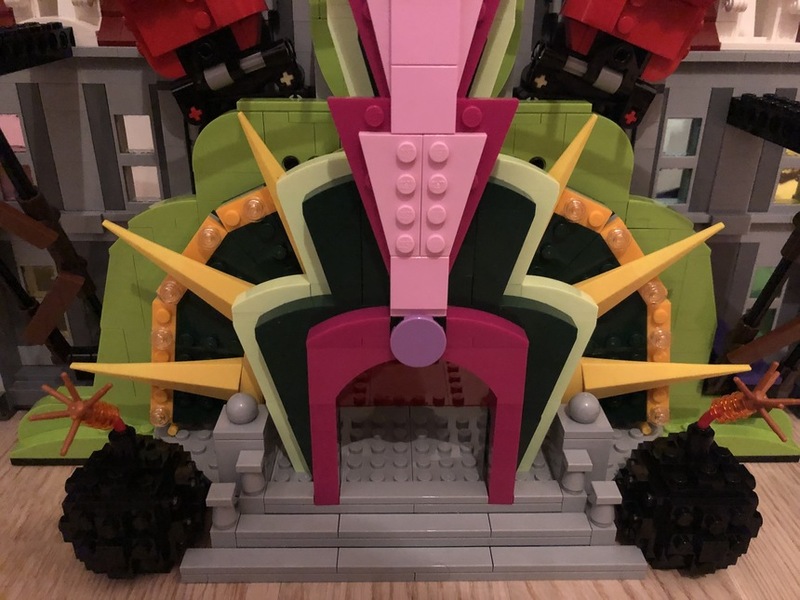 I'd love to see it done though! I'm just playing around with the lighting for the Joker Manor and wondering if you can use the Effect Controller to turn on the lights like in my docking bay. The lights should run one after the other in a circle ... is that possible? that's what I mean. How could I activate the "marquee" effect? Freakmaster it’s a specific controller with the master/daughter boards... what controller are you using? It *looks* like the 12-effect controller, but that one doesn't include a chase effect... exactly. That one is a two-channel controller, so you COULD have alternating lights flash on and off, and dialing up the speed get close to the chase effect. The way this works is that there are four total outputs on the controller. Three are used for the sequential marquee effect (1,2,3) so you can connect as many lights to each of those three outputs as possible. The 4th output is for flashing lights (on/off/on/off-- they are used in the front lights for the marquee as shown in the video). You could easily adapt this for your Joker Manor sign. There is a speed dial on the controller, so you can make the lights chase as fast as you want. I was not aware that I needed an extra controller for it. I thought I could use the Airport Runway style effect. I had overlooked the "pulsing". That means that only the "special" controller would suffice for me? Freakmaster I think the special controller is the least expensive option-- the Airport Runway style effect requires one controller for every 3 LEDs. Ok, and what is the price for the controller?